How long until we have the Bible translated into all the languages of the world? Dr. Reagan: I am always looking for statistics and the statistics always vary, but they are generally the same. Basically, there are about 6,900 languages in the world. Roughly 438, somewhere around 450, have the completed Bible. Another 2,100 languages don't have the completed Bible or the New Testament. Now, I found those statistics are a little bit misleading. The reason I consider them misleading is because those 438 languages that have a complete Bible represent probably 85-90% of all the people in the world. All these others languages we are talking about are used by small tribal groups, right? Greg Pruett: That's right. The ones that are remaining with not a scrap of Scripture are about 2,252. You can get the up-to-the-minute or the most recent official statistics from the Forum of Bible Agencies International. All of the Bible agencies cooperate together through that website and through their own individual efforts as well. So, about 2,252 languages have no Scripture whatsoever and about 353 million people speak those languages. It might be somewhere around a billion that don't have a New Testament so they are also in a pretty serious situation. But, aside from that, the remainders have access to either a New Testament or a Bible in their language, so a large portion of the world's population now has access to God's Word. Dr. Reagan: There are many teams out there working right now to get these last language groups their own Bibles, not only from Pioneer Bible Translators. Greg Pruett: Yes, there is Wycliffe, the United Bible Societies, and other groups like the Lutheran Bible Translators. All of these we partner with closely together. We are really tight. We are truly living in the end times now because more cooperation and stronger synergy is being developed than ever before in history. Dr. Reagan: So, if you are going to go in and start working with a particular group to get the Scriptures into their language, you would check with these other translation groups first to make sure they don't have the same purpose or idea? Greg Pruett: That's correct. And, it's getting to be the situation that if the Bible translation movement continues to develop the same momentum that they've had over the last 30 years, that over the next 20 years we are going to start seeing every Bible translation project in every viable language that is really ever needed. I'd place that just within the next 20 or so years. So, if the same momentum continues based on the trend of the last 30 years, we can project into the future that over the next 20 some odd years we are going to start seeing every Bible translation project that is ever needed come to completion. The Bible translation movement is so active that we have to check with each other first or we are going to duplicate our efforts. Really, it's getting harder and harder to find a Bible translation project left that covers a language that has over 100,000 speakers. We are at the point where we are doing a lot of work to make sure that every language over 100,000 speakers is going to have a Bible translation project going on in it soon. It won't be too long before we are going to be looking at the 50,000 level and then soon we will be looking at the 30,000 level. It should be that in 20 something years from now all of those small language groups will be spoken for, God willing. Dr. Reagan: I would imagine that this enormous effort to get he Bible translated into every language out there must really require a lot of funds? Greg Pruett: It is an extremely expensive to go to other places and mobilize other people. We have partners like the Seed Company. Wycliffe US has been launching fund raising campaigns after fund raising campaign. The rest of us are all really working hard to not just get the funds, but the people who have the skills. Dr. Reagan: It seems to me that every church in America that has any heart for missions should have at least one Bible translation group in their budget. Greg Pruett: I agree with that whole-heartedly. It would make my life a lot easier! Dr. Reagan: I'm hoping some of the pastors out there right now will feel convicted about getting some Bible translation group added to their budget. Greg Pruett: We have been praying for years now that God would mobilize the Church to finish this task. Right now we believe we are training the generation of missionaries and are recruiting the generation of missionaries who are going to leave behind them the legacy of a world in which every person on earth could have access to the New Testament in their own language. Dr. Reagan: What a wonderful goal! That is just fantastic. You know, when I think about churches supporting missions I always think about a friend who was on our staff who went to a small church in Kentucky on a Sunday morning. One of the elders got up and said, "Folks, I've been watching TV and there is a terrible drought going on in Africa. People are starving to death right and left. We need to get some aid to them. I found a Christian organization that will do it. Let's raise some money this morning by having a special offering and let's get some help to these people." This staff member was thinking, "Man, this is wonderful, this is great, what a vision to help people." As he was getting his checkbook ready all of the sudden the pastor jumped up, ran up to the pulpit, and responded, "Before we take up this special offering, I want to remind you that we do need a new roof for our building." The staffer reported that it was just like he threw a wet blanket on the whole special offering. In other words, that pastor was saying don't give much because we need more here. Greg Pruett: It's the reality that we live in. But, we must remember the purpose of the Church. The Lord said for the Church to do a certain, primary task, and that was to make disciples of all nations. When we are finished with that task to Jesus' satisfaction, that will be the end of the Church Age. The Church needs to realize this vital purpose of the Church and to live out our purpose with our finances. Dr. Reagan: We really do. I just pray that fellow Christians will be convicted not only to give more to missions, but also to urge their church to give more to missions and to put Bible translation organizations into their budgets. I have a real heart for this and I want to see people do just that. Dr. Reagan: I praise God for you, Greg, and for Pioneer Bible Translators. We all will be praying for you. We are just praying you reach more and more people with the Word of God. 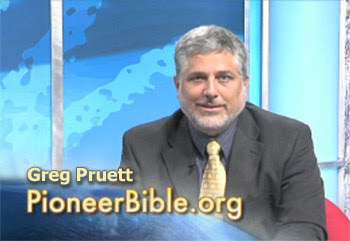 In the last part of my interview with Greg Pruett concerning Bible translation in prophecy, we'll look at some of the prophetic implications of world missions.